When you joined CLUB WYNDHAM ASIA, the Points you purchased were deposited into your CLUB WYNDHAM ASIA account. 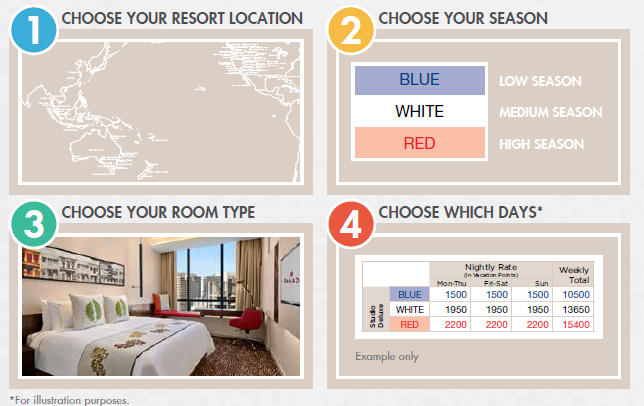 You can use Points to book accommodation for single or multiple night stays at CLUB WYNDHAM ASIA resorts, CLUB WYNDHAM ASIA Associate Resorts, and affiliated resorts through WorldMark South Pacific Club and WorldMark The Club according to the Point Charts, seasonality, reservation guidelines and availability for each property. You also have the ability to book holidays through RCI with your complimentary Exchange Membership. Points are deducted from your account at the time of booking your holiday. All Annual Membership Points have a lifespan of two years. Each year, on your Anniversary Date*, your CLUB WYNDHAM ASIA account is refreshed with the full number of Points you own (unless you have borrowed from your following year’s allotment). CLUB WYNDHAM ASIA Members can choose to borrow Points from the upcoming year to increase holiday options in the current year, as long as the annual levy for the upcoming year is paid in full. Your Anniversary Date* falls on the first day of the month in which you joined CLUB WYNDHAM ASIA. CLUB WYNDHAM ASIA Members are able to borrow from next year’s Point allotment as of the first day of the Anniversary Date of the current year (provided all CLUB WYNDHAM ASIA levies are up to date). Points have a lifespan of 24 months. After this period, any remaining Points will expire on the last day of the month in which your Anniversary Date* falls. *Your Anniversary Date falls on the first day of the month one year following the month in which your Points were first issued when you joined CLUB WYNDHAM ASIA (occurs on the same day each year). Every year on your Anniversary Date of CLUB WYNDHAM ASIA Membership, your account is again credited with the full number of Points you own (unless you have borrowed from your following year’s allotment). When planning your holidays, it is important to remember that the number of Points required to book a particular resort will be determined by four factors – resort location, time of year, room type and day of the week. Members can choose to borrow Points from the upcoming year to increase holiday options in the current year, as long as the annual levy for the upcoming year is paid in full. *Your Anniversary Date falls on the first day of the month, one year following the month in which your Points were first issued when you joined the CLUB WYNDHAM ASIA (occurs on the same day each year). Every year on your Anniversary Date, your account is again credited with the full number of Points you own (unless you have borrowed from your following year’s allotment). If you are a CLUB WYNDHAM ASIA Member seeking even more great holiday options, but you don’t want to dip into your Member Points, then the FlexiStay Advance and FlexiStay options are for you! Extend your getaway or take a spontaneous holiday with sensational last-minute cash rates for unbooked inventory at CLUB WYNDHAM ASIA Resorts and Associate Resorts, plus WorldMark South Pacific Club Resorts. *Prices and any applicable taxes subject to change. 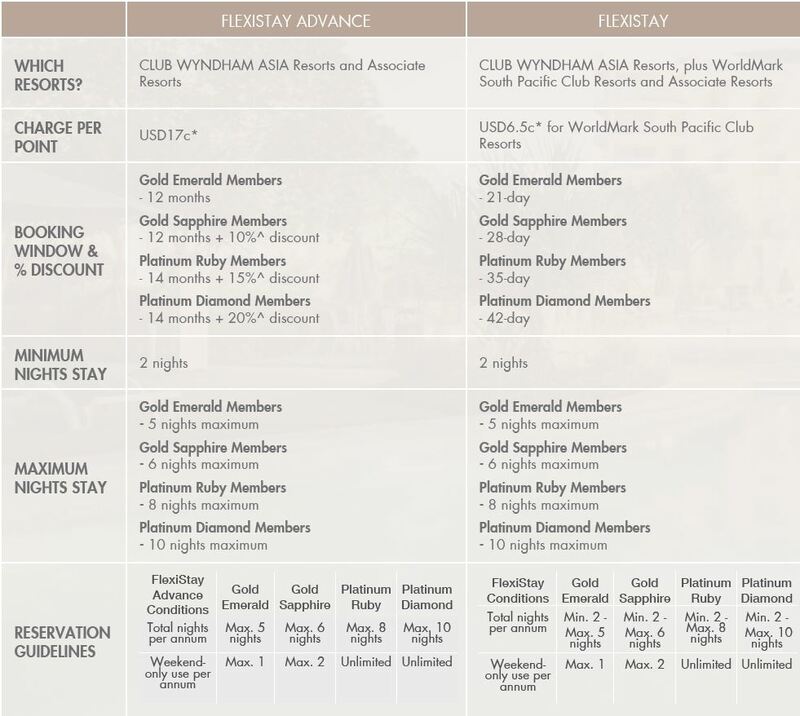 Please consult your CLUB WYNDHAM ASIA Member Services for updated pricing. Prices quoted above are in US Dollars and include the relevant local GST or VAT. Please note that in addition to the FlexiStay Advance or FlexiStay charge, stays in Fiji will incur a Service Turnover Tax (STT) to be paid in Fijian dollars upon check-out at the resort. When your Points are coming up to their Expiry, you have a few options to get the most out of your Membership. Make a Forward Reservation, securing the “life” of Points for a further 12 – 14 months depending on your Membership level. Exchange Points for Wyndham Rewards Points, effectively giving the points another 4 years life# to stay at Wyndham Hotel properties around the world. Spacebank with RCI, allowing you to make reservations and stay in RCI listed properties for a further 2 years.